"I sure hope no one else gets in here." In Florida, Republican state senator Jeff Brandes is making the case that Pinellas County – home of the last metro area in the U.S. to develop a regional transit network – shouldn't invest in light rail because autonomous vehicles will make mass transit pointless. Self-driving cars will eliminate congestion, increase safety, and cut down on travel times, and we need to be prepared for that eventuality and ensure that we don't waste any money in the mean time. 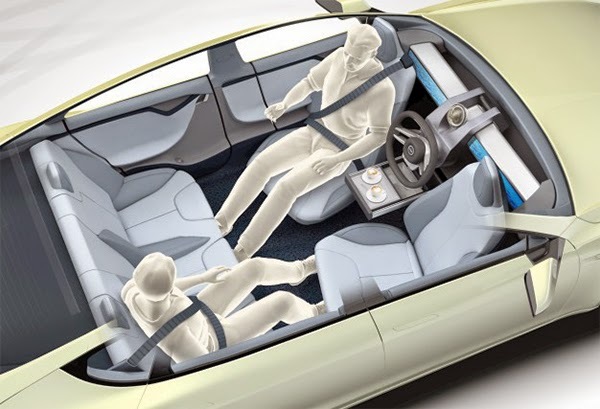 First, driverless cars can drive much closer together than human-operated vehicles. This will significantly increase roadway capacity and throughput, so we should start eliminating roads and replacing them with bike lanes, sidewalks, parks, and housing. Since self-driving cars are so efficient, we can repurpose all that road space for more productive uses. At the very least we should impose an immediate moratorium on all new road construction, because fiscal conservatism. With driverless cars available at our beck and call there will no longer be a need to own your own car, so we should prepare our citizens for this new transportation regime by aggressively promoting car-share services like Zipcar and Car2Go. To make sure they catch on, we may want to ban the use of curbside parking for everyone except car-share users, and give them priority on our highway carpool/toll lanes. If someone buys a car a decade from now it might have to be junked five years later, once driverless cars take over and become mandatory. We don't want people to waste their money on such a poor investment, so we should probably just ban cars entirely until scientists get the autonomous vehicle technology locked down. Everyone will have saved so much money that they'll be able to buy new cars as fast as the factories can churn them out. As you can see, there's so much more to do than prevent people from having an inexpensive, sustainable, efficient mode of travel for the next 15-20 years. As Senator Brandes will no doubt agree, these are policies that complement a pro-driverless vehicle agenda perfectly, and will even serve people well if his predictions don't come to fruition, which they most certainly will. Listen Jeff: I know that some Republicans have a reputation for being shills for the highway industry, but I can tell that you take the future of transportation seriously and that you won't let anyone stand in the way of progress and good financial stewardship. I look forward to your upcoming bills, Senator.